Amazon currently has the Disney / Pixar Ultimate Collection listed for $109.99, or a whopping 54% off the list price of $239.92. That’s Toy Story 10th Anniversary Edition, A Bug’s Life, Toy Story 2 Special Edition, Monsters, Inc, Finding Nemo, Incredibles, Cars, and Ratatouille all in a big, shiny DVD box set substantial enough to confirm that, yes… you are indeed a person of great means and virility. Congratulations in advance. 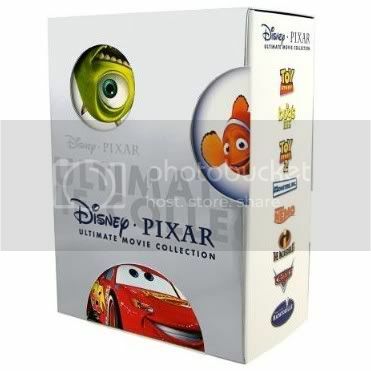 Buy the Disney / Pixar Ultimate Collection. This would be a good deal if I didn’t already own all of those movies, and if it included the pixar shorts DVD and the Pixar Story DVD.